MPR News' full coverage of the 2018 midterm elections, including the latest breaking news, analysis and results. 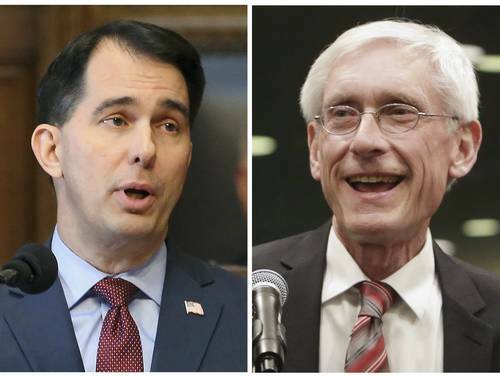 Wisconsin's race for governor is shaping up to be the tightest in more than 50 years and may be headed for a recount. On the air: Todd Rapp (@toddrapp) on the 1st Congressional District. "It's very much like what we went through two years ago. There's about 100 precincts left. 40 of those precincts are in Mower County, where Austin is. And if we remember correctly, we sat here waiting for Mower County to come in before we knew that Tim Walz had won. It looks like this is repeating itself. It looks like the last set of precincts that would be good for Feehan. But there's a pretty significant number of votes in that county that are left out there. If he wins Mower county comfortably, it'll still be tight, it may be a recount, but it'll be much harder for Hagedorn to win." There were late alarm bells sounded last week over longtime GOP Alaska Rep. Don Young, who as the longest-serving member of the House is the dean of the House. The main Republican superPAC started spending to help shore him up. It's worth watching to see if a Democratic wave could even reach Alaska. In the governor's race, the incumbent independent, Bill Walker, dropped out of the race just two-and-a-half weeks before the election and endorsed Democrat Mark Begich. This, though, is Republicans' best chance to flip a gubernatorial seat with Mike Dunleavy. This story has been updated to correct that Dean Phillips formerly ran his family's liquor company and is a grandson of the late advice columnist Abigail Van Buren, better known as Dear Abby. New York Times’ “live polling” fares well in Minnesota. Mostly. Readers who are still hanging with this live blog may be among the die-hards who are aware of the New York Times’ massive “live polling” experiment this year. In partnership with the Siena Research Institute, the Times conducted 96 polls in hotly contested races – including 4 in Minnesota. Although polls are snapshots in time that don’t necessarily reflect the later outcome, the Times’ early September poll showed Dean Phillips (tonight’s winner) ahead. Similarly, they showed Angie Craig leading in their early October poll of district 2. 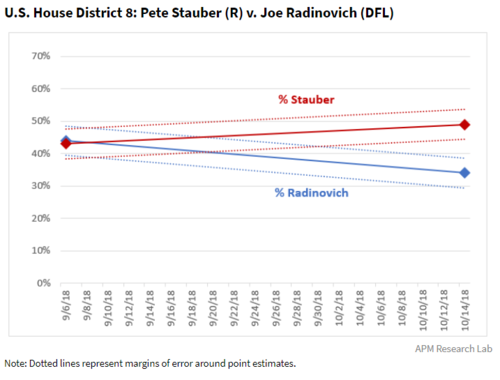 The Times polled Minnesota’s 8th two times: showing a tie in early September, and then eventual winner Pete Stauber ahead by a 15-percentage point margin in mid-October. That big swing led the New York Times’ Nate Cohn to write a transparent, almost soul-searching, article. Stauber did indeed win, although with 92 percent of precincts reporting his margin is much narrower that the poll suggested: only 4 percentage points.